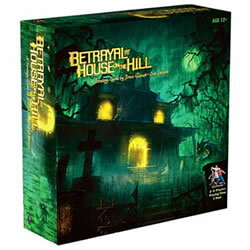 Great as a Halloween game or for any occasion when you want to play something a bit spooky, Betrayal At House On The Hill is a different game every time with new an interesting lay-outs. This fun and suspenseful game lets you explore "that creepy old place on the hill." But wait, while you're having a mystic misadventure one of you will turn on all the rest. Betrayal At House On The Hill has a very high replay value since everything in the game changes so much from game to game. This is a very good game for 3 to 6 players an will give you hours of fun. Do you have what it takes to win the game or will it freeze the heart of any horror fan? Pick this game up today! If you are the first traitor or hero to complete its goals for the haunt you will win. You will get 2 haunt books, 44 room tiles, 1 entrance hall tile, 6 plastic character figures, 6 two-sided character cards, 30 plastic clips, 8 dice, 1 turn/damage track, 13 omen cards, 22 item cards, 45 event cards, 291 tokens and the official Betrayal At House On The Hill game rules and instructions. Please keep in mind that the official Betrayal At House On The Hill dice-card rules and instructions could be different depending on the game version you have. The rules below are some of the exact directions on how to play Betrayal At House On The Hill. Share with us your comments, funny stories, tips, advice, strategies, creative ways to play, questions about how to play, problems with the rules or anything you want about Betrayal At House On The Hill. All submissions will be reviewed within 24 hours. Click here to add your Betrayal At House On The Hill comments.